Syria had occupied it for 44 years during which time no agriculture of any significance or restoration of its terrain ever took place. Instead, the Golan was a Syrian army artillery encampment whose sole purpose was to deliberately rain down an endless barrage of shells upon Israeli farmers, fishermen and villagers . So what is the Jewish history of the Golan Heights and what is its overwhelming Biblical significance to the reconstituted Jewish state? Perhaps we should return primarily to the Biblical books of Joshua and Numbers. § Before the Tribes of Israel would cross the River Jordan and enter the Promised Land, the first among them had already taken possession of territory east of the River Jordan. These were the half tribes of Manasseh, Gad and Reuben who liberated the Bashan and Gilead from the Amorites. 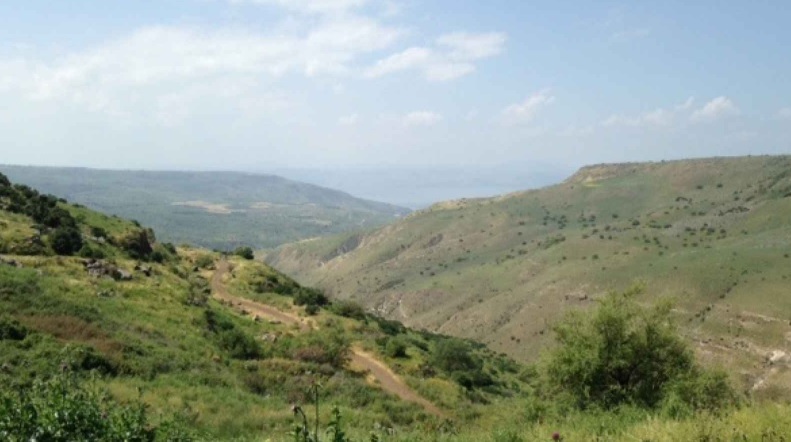 § The Bashan region, now known as the Golan Heights, is a part of the biblical territory promised to the Patriarch Abraham and the Jewish people for an everlasting Covenant – the Covenant of the Parts – recounted in Genesis 15. The city of Bashan was a refuge city (Deut: 4:43). § During the Biblical period of the Jewish Kings, a battle high on the Golan took place between King Ahab and the army of Aram. A Jewish victory took place at the present site of Kibbutz Afik, which lies a few miles east of Lake Kinneret, the Sea of Galilee. § After the end of the Babylonian Exile, and during the Second Temple Period, Jews returned to their homes on the Golan. Subsequently the returnees were attacked by gentiles and Judah Maccabee brought his forces up to the Heights to defend them. § At the conclusion of the Hasmonean Period, King Alexander Yannai finally re-conquered the Golan and Jews returned yet again. They rebuilt communities in central Golan, including the major cities of Banias and Susita, which formed part of the defense of the Golan. § Their residents fought heroically against the Roman legions during the Great Revolt of 135 CE, known also as the Second Uprising. It was led by the charismatic Shimon Bar Kokhba, known as the “Son of a Star” and an authentic Jewish folk hero. It is estimated that some 10,000 residents of Gamla alone perished fighting against Rome. § In the succeeding Talmudic Period, Jewish communities flourished and expanded. Archaeologists have found the remains of 34 synagogues on the Golan. Jewish life on the Golan largely ended after the defeat of the Byzantine army by Arabs from Arabia carrying the new banner of Islam and the region descended into a long period of neglect. § But Jewish life returned yet again in the latter years of the 19th century when members of the Bnei Yehuda society from Safed purchased land on the Golan. In 1891, Baron Rothschild purchased around 18,000 acres in what is present day Ramat Magshimim. The Jewish pioneers of the First Aliyah (immigration) began to farm land they had purchased in the Horan region until the Turkish Ottoman occupiers evicted them in 1898. Their land was then seized, and in 1923 the entire Golan was given away by Britain to the French Colonial Mandate over Syria and Lebanon. Zionist leaders had earlier demanded the Golan be included within the new Jewish National Home because of its immense historical roots in Biblical and post-Biblical Jewish history. But Jewish liberation of the ancestral land was not possible until Israel was forced to fight for its very survival during the 1967 Six Day War. And consider this again. The British colonial power gave the Golan to France’s Syrian colony in 1923. Syria attacked Israel in 1967 and lost the Golan. Syria had occupied it for 44 years. Israel’s liberation of the Golan has now lasted 51 years. Ask yourself then, who has possessed the Golan the longest and who has millennial historic, religious, Biblical and post-Biblical attachment to it?